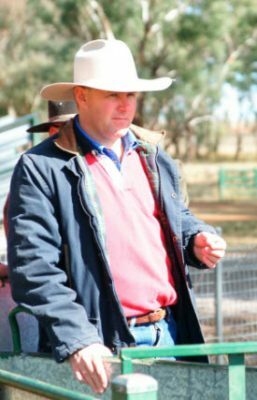 THERE can be little doubt that producers making selection decisions on future sires have access to a broad and comprehensive range of data. Much of the information producers require, including pedigree and performance information has long been available through BreedPlan EBVs. The inclusion of genetic data has enhanced the value of EBVs as well as providing greater certainty regarding genetic diseases that are an issue in many breeds. Although data such as EBVs has been around for some time, there are still some common misconceptions held by producers that can influence their selection decisions. One of the more common misconceptions relates to the Accuracy of an EBV. The easiest way to consider what accuracy refers to, is to focus on what an EBV actually is. EBV stands for Estimated Breeding Value. Estimates change over time as more becomes known about an animals breeding progeny. Over time the accumulation of data brings the EBV closer to the True Breeding Value of an animal. Accuracy is the measurement that explains the amount we know about an animal. Higher levels of accuracy mean that much is known. This information includes performance data, progeny data, carcase feedback, genetic information and pedigree. High accuracy numbers mean that an EBV is unlikely to change in value. At the same time, lower accuracy animals are those that haven’t had the opportunity for data to be comprehensively recorded. Young sires and those that haven’t had much use in breeding programs are often low accuracy animals. The accuracy figures that are provided on these bulls are derived from pedigrees, performance of parents, as well as from relationships with other traits. Increasingly the input of genetics through Single Step analysis also increases accuracy. In a practical sense, low accuracy sires are likely to experience changes to their individual EBV values. Over time we have seen animals experience changes to EBV values that are both positive and negative as more data is included in their analysis. Less than 50 percent accuracy – the EBVs are preliminary. In this accuracy range the EBVs could change substantially as more direct performance information becomes available on the animal. 50-74pc accuracy – the EBVs are of medium accuracy. EBVs in this range will usually have been calculated based on the animal’s own performance and some pedigree information. 75-90pc accuracy – the EBVs are of medium-high accuracy. EBVs in this range will usually have been calculated based on the animal’s own performance coupled with the performance for a small number of the animal’s progeny. Greater than 90pc accuracy – the EBVs are a high accuracy estimate of the animal’s true breeding value. It is unlikely that EBVs with this accuracy will change considerably with addition of more progeny data. When confronted with a sale catalogue, producers should consider a few key points. The first is to consider only the bulls that have traits that are important to a breeding objective. The next is to focus on bulls that are above average for breed average in those traits. These are the animals that are more likely to have a bigger influence within your herd. 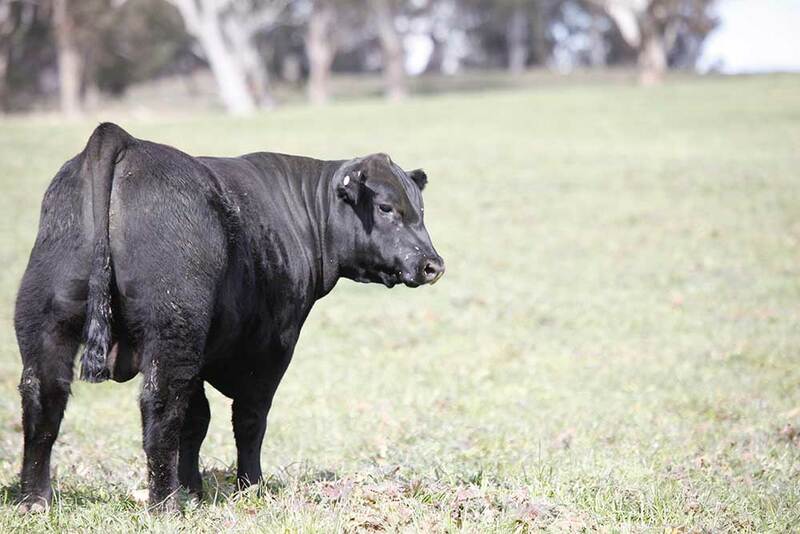 Within this selection of animals, there may be bulls that have greater accuracies and these should be the referred bulls to consider for further evaluation at a sale. Finding above average, high accuracy sires can be a challenge that is unrealistic for many producers. In these cases, the compromise is to seek bulls that are at least above breed average for the traits that are of focus. A second key point to remember is the direction of most herds is not dependent on a single sire alone. Often it is the influence of a team of bulls that will determine breed directions. 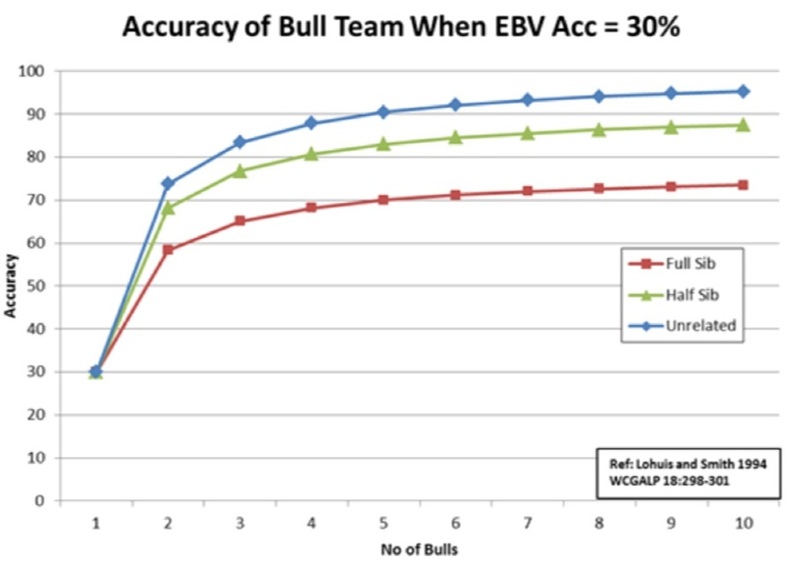 In some cases individual bulls within the team may have ‘low’ EBV accuracy, overall the team’s accuracy for that EBV will be much higher. In practice this means that individually some bulls within the team will perform above expectation, some will perform below expectation and some will perform as expected. This ‘averaging’ effect means that over the entire bull team the EBVs will describe the breeding value considerably higher accuracy. The more bulls within a breeding team, the greater the increase in overall accuracy for the team. Ultimately, for producers choosing sires, the accuracy of an EBV will help them have greater confidence in the bulls’ potential to move a herd closer to breeding objectives. If a desired bull isn’t as high accuracy as expected, it’s important to select sires that are better than breed average. Over time, this combined with the role a team of bulls plays within a herd should help producers see positive changes within their breeding herd. Measuring the wrong things very accurately can be termed…….”false precision”. Al, I think your ‘averaging effect’ across a portfolio/ team of bulls point hits the nail on the head. It’s important for people to realise that EBVs are regressed for accuracy and that most commercial scale producers should focus on EBV values rather than accuracy.